As usual, flipping through food magazines looking for recipes. I now tear out the recipes that look good vs. dog-earring them. I then clip them on the baker’s rack in my kitchen and have to make them. 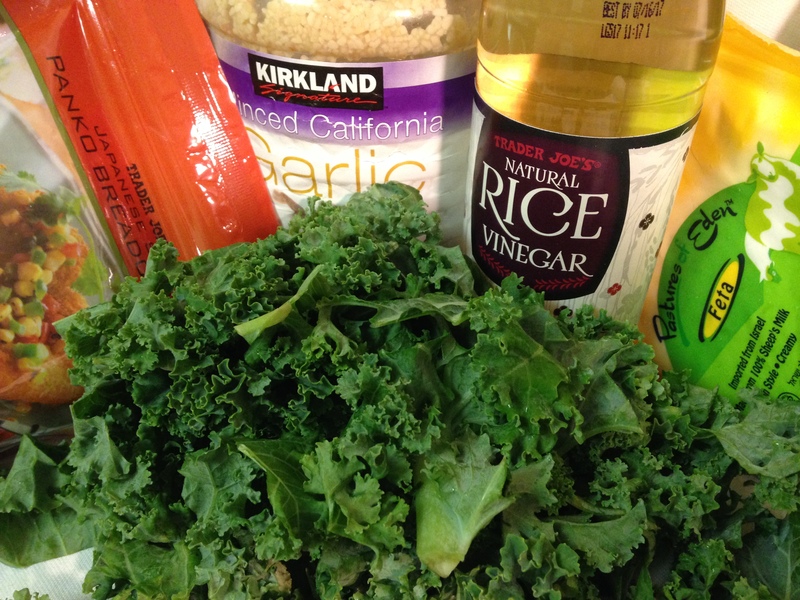 So part of last night’s dinner was Kale Salad with Garlicky Panko from Food & Wine. 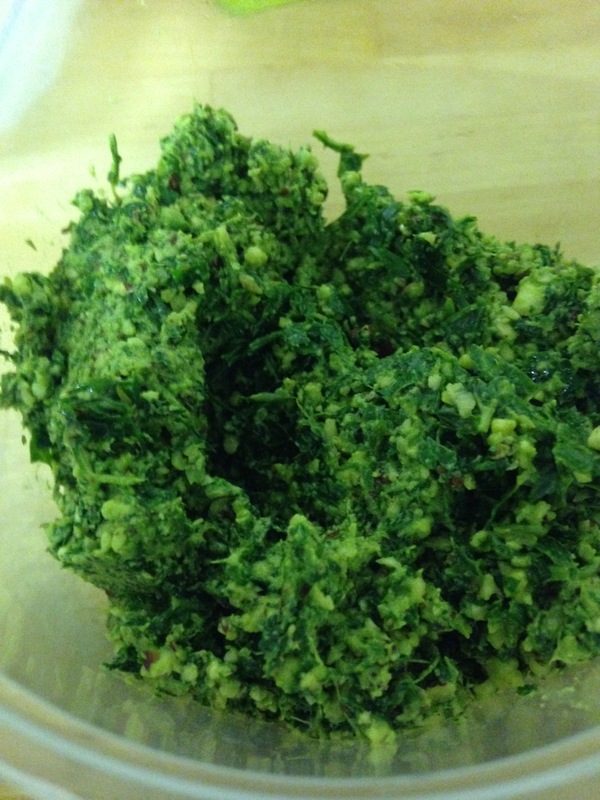 Hmmm…kale, delicious and garlic, delicious X2. I could not stop eating this stuff!!! 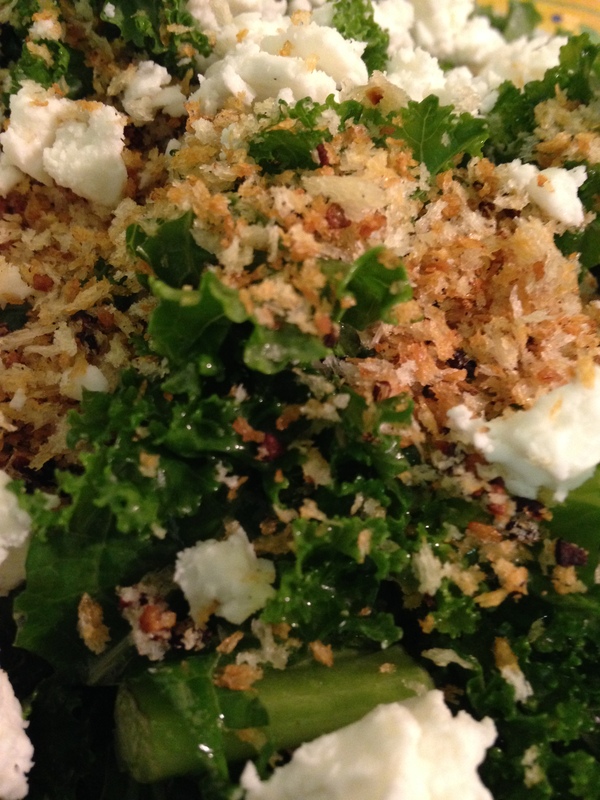 The slight bit of saltiness from the feta, the garlic in the crispy breadcrumbs. WOW WOW WOW. Try this! You will not be disappointed. Got to enjoy a pasta sauce I hadn’t had for awhile the other night. It has tons of veggies and is super simple to make — Spaghetti with Fresh Tomatoes and Rocket (Arugula) or Spaghetti con Pomodori e Rughetta from The Top One Hundred Pasta Sauces by Diane Seed. Skin the tomatoes by first plunging them into boiling water for a few minutes (I have always skipped this step). Chop finely (I keep them in chunks) and place in a large bowl together with the finely chopped garlic and coarsely chopped rocket (arugula). Add the olive oil and S&P to taste and leave for at least 2 hours. I was in charge of the sauce…got to enjoy some nice homemade pasta. Cook the pasta as usual, drain and stir in the sauce. Kitchen gadgets can be so much fun! I went to a business lunch and there were door prizes. I never win anything. Most of the giveaways were gift cards, anyway, and as nice as essential cash is (they were Visa cards), I knew I wouldn’t win. Well, suddenly I heard my name. But, I didn’t get a GC. The stars aligned and I won the kitchen gift bag. The rep giving this one away had been to Sur La Table and had a field day. WOW! I was in luck. So, I got all sorts of new toys that I would totally never go buy for myself but loved getting. The one I’ve played with the most is the Berry Pincher (that’s the formal name I give it). The manufacturer, Chef’n, calls it the StemGem. You can remove the leaves from strawberries and clean all sort of other things. You just plunge the sharp teeth of this thing right in the top of the berry. You give it a little twist. And yank it out. The motion makes the picture a bit fuzzy! Sorry. The website has better pics. 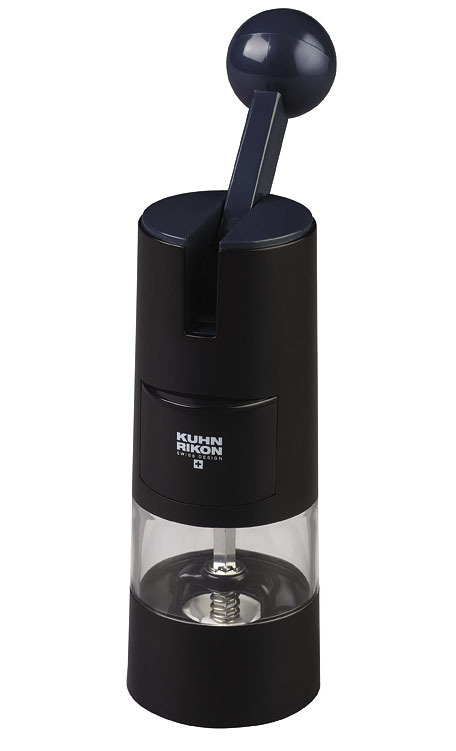 A Kuhn Rikon Pepper Mill with Ratchet Handle — so cool with the handle! A Joseph Joseph Rocker Garlic Masher — SMASH! Great fun, you can also use it to get rid of the odor in your hands. And the last toy, by the same producer as the strawberry toy, I got the Zipstrip Herb Stripper. I haven’t actually gotten around to using this yet. I needed it the other day and of course was cooking in somebody else’s kitchen when I was looking for it!! 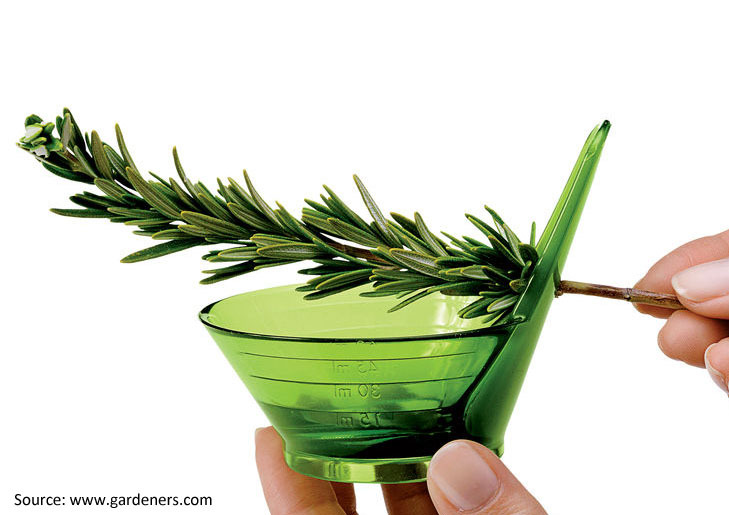 So if you want so new additions to your kitchen, consider checking these out. Was looking for something new to make last weekend and had been eyeing this gazpacho recipe for awhile so finally got around to giving it a try. 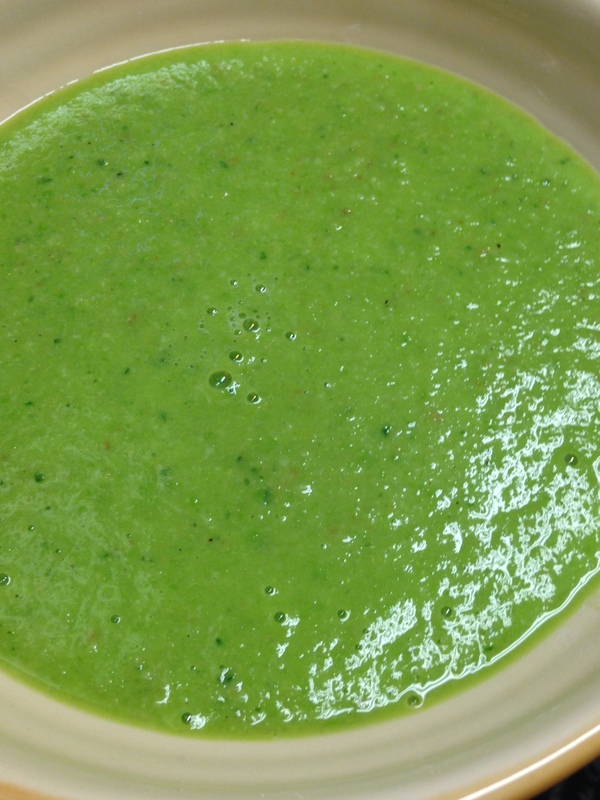 It was Fresh Pea and Garlic Gazpacho from Cooking Light. Pretty simple, as with most gazpacho. 2 garlic cloves — MORE! 1) Cook English peas in boiling water 4 minutes. Drain and rinse with cold water until cool. 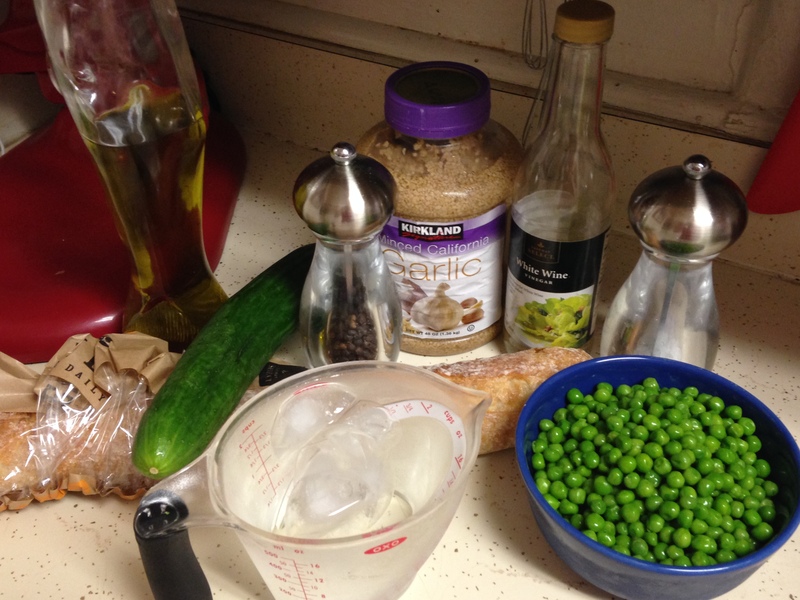 Set aside 1/2 cup peas. *I did some research on English peas while in the store(oh, smart phones, how we love you). Long story short, I deduced that they are the same as frozen green peas. Efficiency! You can eliminate this whole step. 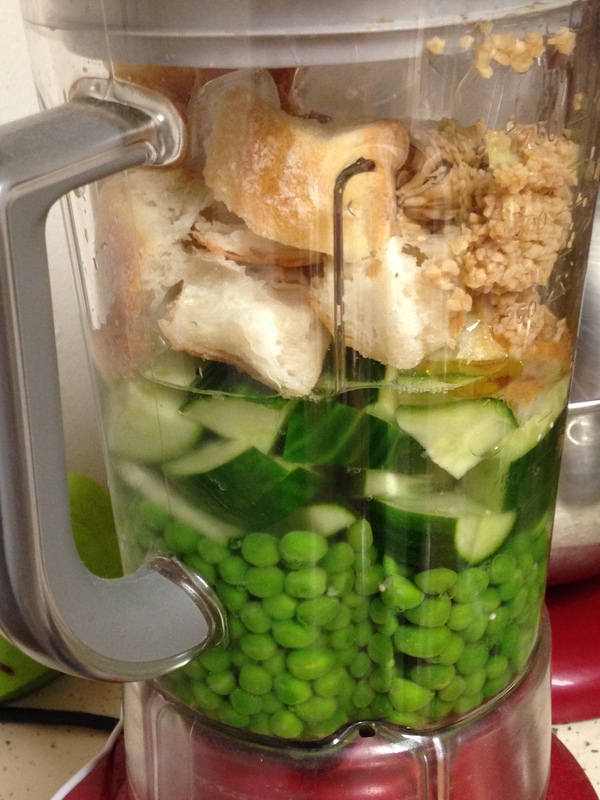 2) Combine remaining peas, ice water, cucumber, French bread cubes, 2 tablespoons extra-virgin olive oil, sherry vinegar, and garlic cloves in a blender; process until smooth. Stir in salt and pepper. 3) Ladle 1 cup soup into each of 6 bowls. 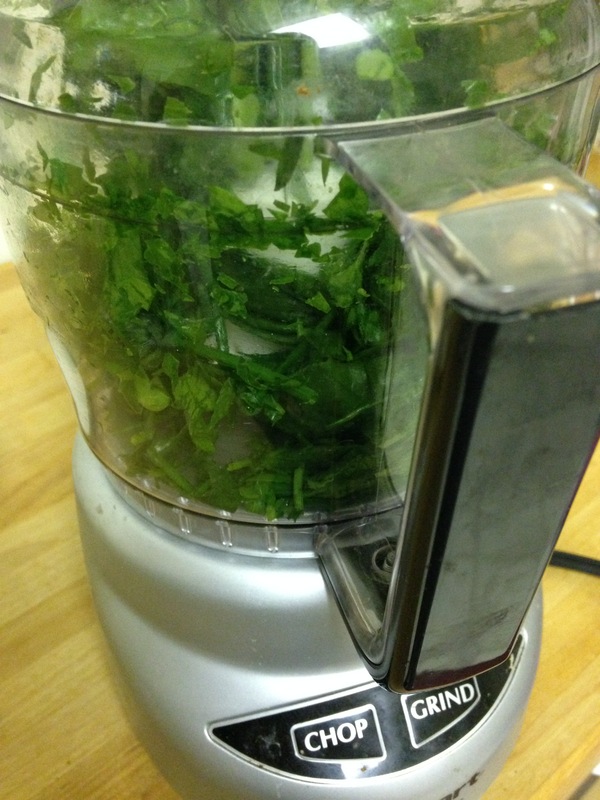 Garnish with reserved peas, fresh pea shoots, mint leaves, and 1 1/2 teaspoons extra-virgin olive oil. I opted out of the garnishing for a few reasons — there was no mint at the store, I didn’t use the fresh peas, hence has no shoots and finally, I was eating alone so who did I have to impress with decor? 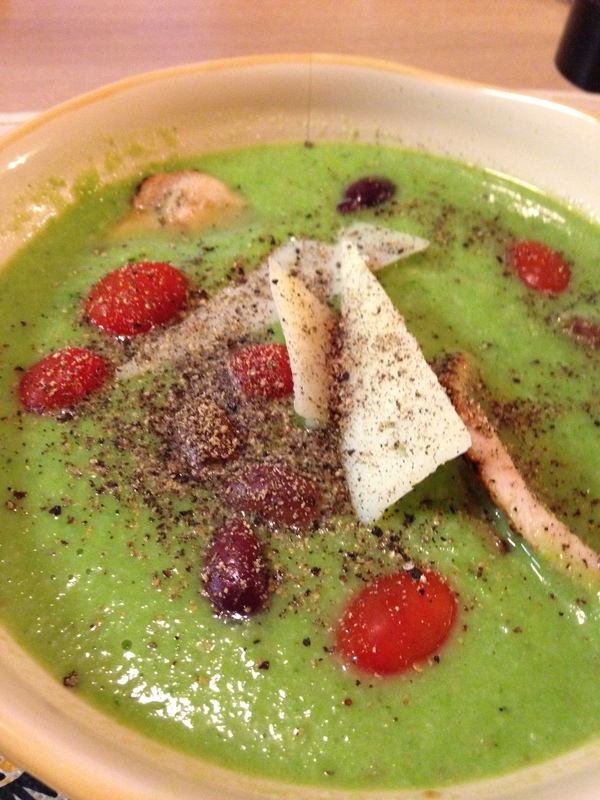 I just put my own good stuff in the gazpacho — tomatoes, olives, manchego and grilled chicken. Very nice, refreshing soup. It did seem to be missing something and I still can’t place it. Might be lemon or a bit more salt. But, still a nice twist from the normal gazpacho. I was in the deadly Wegman’s the other day roaming through the aisles and an aisle-end product display caught my eye. 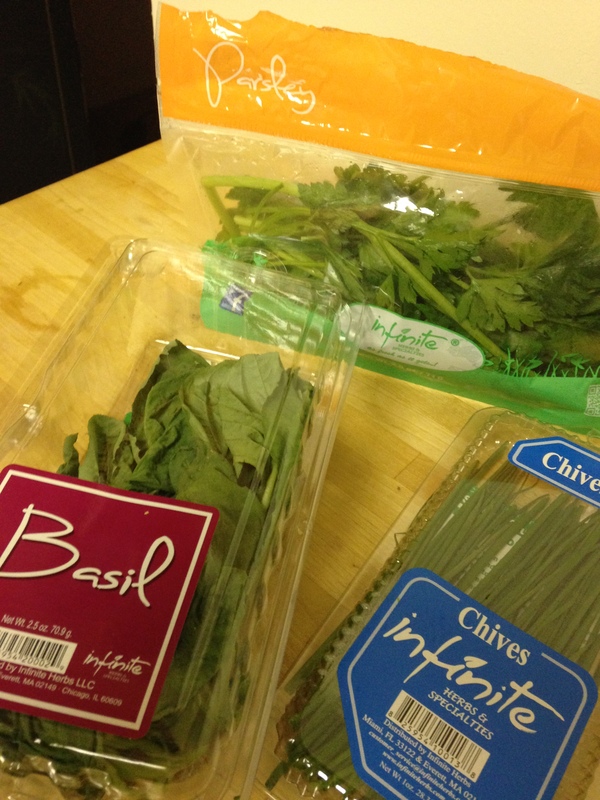 The main ingredients/flavors were things I like, the nutritional value was good, so I had to give them a try. The product — Lesser Evil’s (love that name) Super 4 Snacks, White Bean, Quinoa, Lentil, Chia, with Kale & Roasted Garlic. And, after visiting their site, I noticed a product I’d tried before that’s addictive, the Chia Crisps. A serving has 46 pieces — that’s a nice amount to be able to eat! And has 110 calories, 3g fat, 2g monosaturated. There are 18g carbs per serving, with less than 1 of the grams being sugars. The pieces you eat are light and hollow, the shape of ziti. They just sort of float in your hand, they weigh so little! 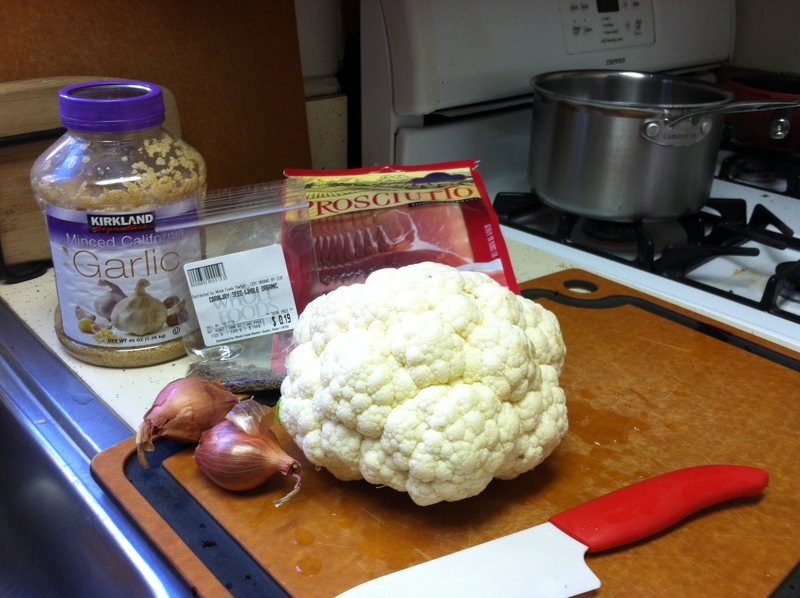 I opted to blanch the cauliflower then toast the caraway seeds. 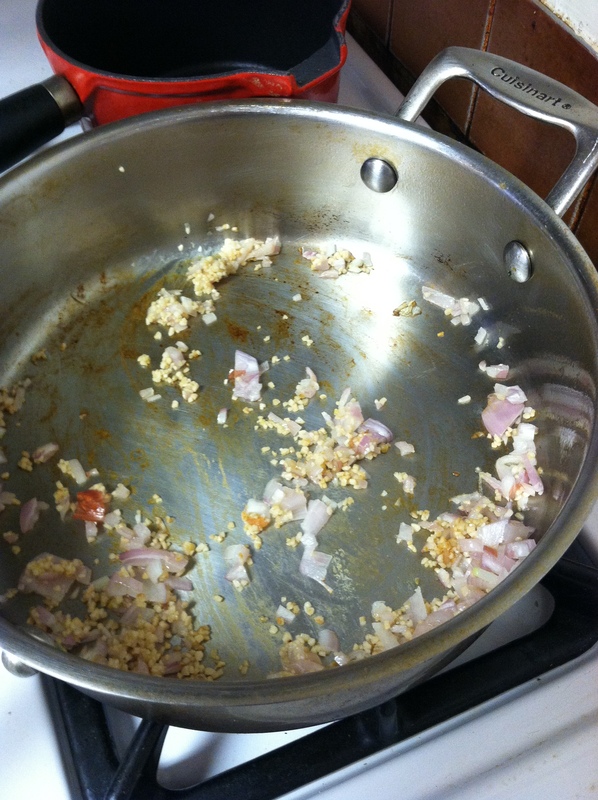 Next step was making a mouth-watering aroma spread around my apartment by sauteing the shallots and garlic. 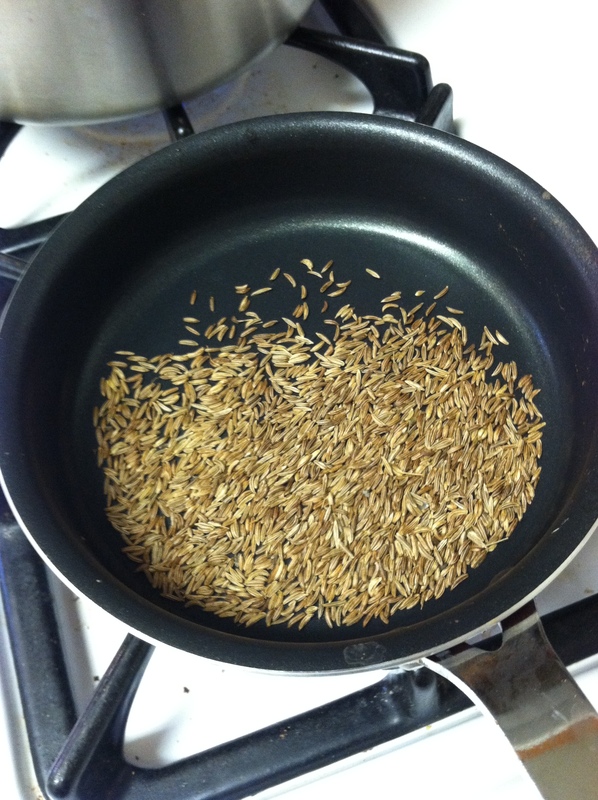 After that I added the caraway seeds and the prosciutto that I’d cut into 1/2″ pieces to the pan. 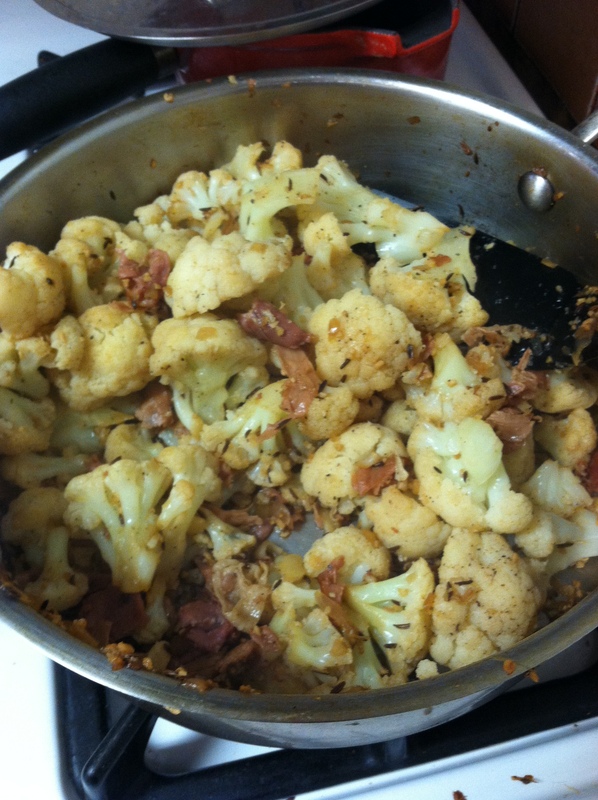 Sauteed everything for a few minutes then added the cauliflower and some S&P. End result, hmmm, not what I was hoping for or expecting. It wasn’t bad, but absolutely nothing to write home about. After tasting and tasting it more, I kept trying to figure out what I was truly hoping for. I still took it to the tailgate and nobody complained about it, but did not rave about it. And there was more than enough left. 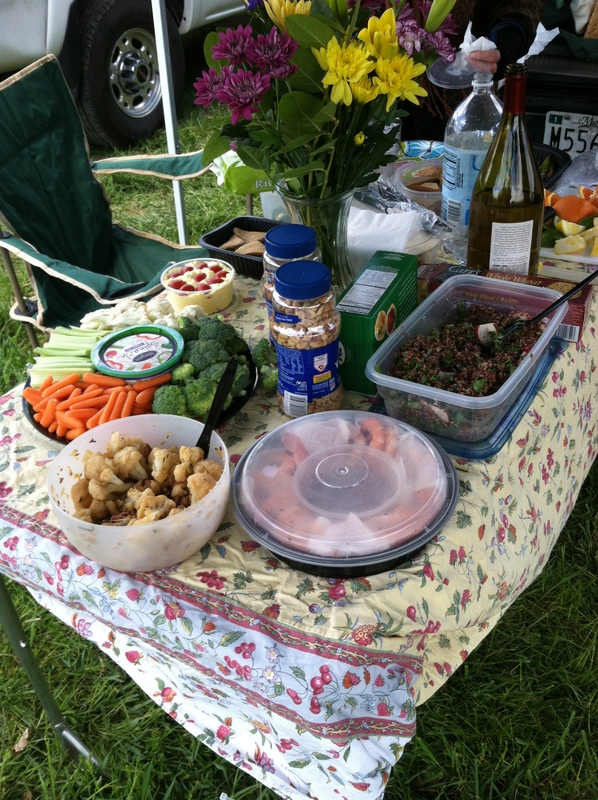 There was a large amount of other better stuff to eat (that I also leaned towards). I was hoping it would taste better today. Not so much. I’m just picking the prosciutto out and enjoying that. If anybody has suggestions, would love them. But, I think this was just a good attempt and trial and error.